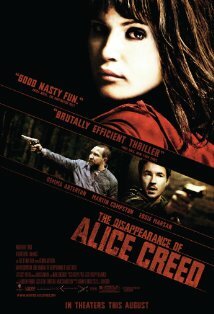 The disappearance of Alice creed is not your standard Hollywood thriller and is actually a well written crime thriller with some superb acting by all involved. At times the film feels a little like a play due to it's content and closed nature but as a psychological thriller... wow, what a mind @#%. The standout performance is by Gemma Arterton who is more than just a pretty face and really showcases her talents as actress in the Disappearance of Alice Creed as opposed to some of her other fantasy roles. Then we have Eddie Mars (Vic) and Martin Compston (ed) who play the two villains and really get into the headspace of these two kidnappers as they turn a house into a prison. The story revolves around Alice, the daughter of a wealthy business who is kidnapped by Danny and Vic, two men who thatch a plan to become rich. As their plan succeeds to capture Alice, the psychological game of cat and mouse begins but it appears that this "mouse" is more capable than they were first lead to believe. As the mind games commence and a layer of violence forms, the deadline to the ransom threatens to escalate for all involved. Needless to say, it goes beyond what I was expecting and without the acting of Arterton, I don't believe this movie would have been so enjoyable. The script is great as are the locales of this movie and all in all, a very professional piece. For a non mainstream/art house film, the video quality of Alice creed boats sharp images, good levels of black and a minimal amount of artifacting. Some scenes are a little dark but this is due to story and settings but overall, it's a good looking movie. Audio supports Dolby digital 5.1 with good audio levels and clear audio. There are a couple of standout moments that do make use of the surround sound track. For special features, Alice Creed supports an in-depth audio commentary track with director J. Blakeson, a making of featurette, extended scenes, storyboards and the theatrical trailers. With some stunning cinematography from first time director J. blakeson, he truly manages to draw you into this film, including the headspace of Alice, Danny and Ed that leads to a unexpected ending, even though all the signs were there. Brilliant!